Rustic Mexican pine furniture has a sturdy and robust look, with thick pieces that come together to evoke images of traditional farmhouses and home cooking. The wood is kiln-dried, with a light wax finish that allows the true beauty of the wood to shine through. Intricately decorated wrought iron-look accents look starkly beautiful against the light color of the wood, and gives it that authentic Latin-American character. The soft pine also allows for hand carved embellishments, which lends a unique charm to any piece of furniture. This style is extremely versatile, and complements nearly all varieties of home, from traditional to modern. The versatility also means that rustic pine furniture looks great in any room, and also makes outdoor areas look fantastic. The great advantage in having the natural knots and lines of the wood visible to all is that it gives each piece of furniture its own individual character that looks slightly different from those owned by anybody else. Each furnishing is one-of-a-kind, and you’d expect to pay a fair amount for such a privilege. Not so. 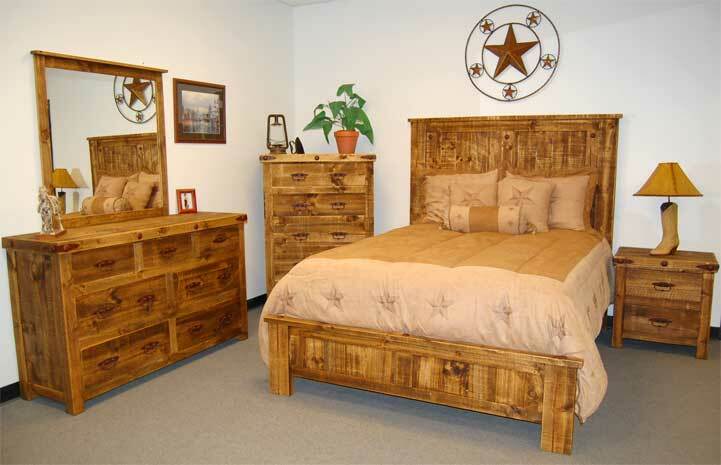 One of the most attractive features of rustic Mexican pine is the price. Compared to other styles of furniture, it is quite affordable, yet doesn’t look flimsy or shoddy. The furniture takes advantage of the optimal balance between look and price. The inexpensive nature of the furniture also means that there is more scope to purchase multiple items, and give a harmonized continuity of theme throughout the home. Mexican pine furniture is readily available to order over the Internet, or in select stores which import direct from Mexico. Look for pieces that have all the components made out of wood. Some use laminates and MDF on the insides for parts like shelving or backing, and whilst this is certainly cheaper, it is definitely not as sturdy or authentically appealing. Internet orders will usually ship items in flat packs to save on shipping costs. There’s no need to be anxious about the quality, though. The simple and strong design of Mexican furniture makes it a lot more durable than other designs that are flat packed, and also makes it very easy to self-assemble. Because rustic pine furniture does not use paints or varnishes to seal the wood, there is a tendency for this type of furniture to warp and crack slightly in extreme hot or cold conditions. This is not a huge concern, however, since major structural warping or cracking is prevented by the kiln-drying process.